Commonly used to separate, identify, and quantify the individual components of a mixture, liquid chromatography (LC) is a vital tool in the arsenal of analytical techniques used for research and development, as well as quality control across a wide range of industries. The analytical requirements in many of these sectors – from food safety to pharmaceuticals – have become ever more challenging with, for example, more complex matrices to analyze and lower detection limits required. For many lab technicians, LC is one of many techniques they need to master. For them, ensuring their results are accurate and reproducible is a must, but being able to increase instrument uptime, avoid rerunning samples, and increase lab throughput are now their daily challenges. In this article, we look at some common issues that can create “chromatography heartache” and compromise these goals. Some fall into the troubleshooting category, others are more about system optimization, but all can have a real impact on the quality of chromatography achieved. 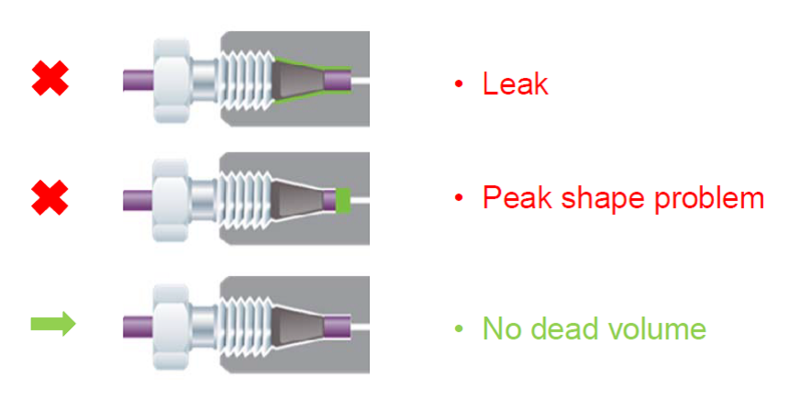 Poorly connected fittings have long been recognized as a leading cause of chromatography issues, leading to peak broadening, splitting, and tailing, as well as loss of resolution. The effect is seen both in UHPLC and HPLC setups. To simplify connectivity, many labs have adopted finger-tight polymeric (PEEK) fittings. Traditional stainless fittings typically require two wrenches to tighten, while at the same time requiring proper alignment of tubing into the column inlet. The process is not straightforward, especially in tight spaces, and typically requires some expertise to get right. It’s easy to get the alignment wrong, resulting in leaks, or the creation of a mixing chamber ahead of the column (Figure 1). Figure 1: Potential fittings issues include leaking connection (top) and mixing chamber (middle). With the tubing flush to the column (bottom), there is no dead volume and the connection is perfect. In addition, stainless fittings may also be irreversibly swaged onto the tubing. For fittings that are incorrectly aligned, both the fitting and tubing must be discarded, resulting in time wasted, frustration, and financial loss. Agilent’s InfinityLab Quick Connect fittings address these challenges. A unique design and proprietary spring-loaded closure mechanism produces a sure connection with zero dead volume. The fittings use a simple lever mechanism to provide a secure connection up to 1300 bar, without using wrenches and tools. This feature makes them incredibly easy to use and therefore a valuable asset to less experienced chromatographers. For space-limited situations where connections are too tight to use this design, an alternative fitting that also incorporates the same unique spring-loaded mechanism is also available (Agilent’s InfinityLab Quick Turn fittings). Quick Connect and Quick Turn fittings create a reliable connection every time, even after 200 reconnections. In a troubleshooting situation, poor chromatography performance is not always readily tracked to connections. Figure 2 shows how capillary tubing being flush with the ferrule, rather than seated properly to the inlet, caused tailing on all peaks (top chromatogram), resulting in a void that acted as a mixing chamber ahead of the column. By ensuring correct connections (bottom chromatogram), peak shape became symmetrical. Column lifetime can vary dramatically depending on sample conditions. The pH, temperature, buffer choice, and the cleanliness of samples can all have an impact on column lifetime. Extremes in mobile phase pH can affect silica-based column stability, leading to poor separation. At low pH, hydrolysis of the bonded phase can cause inconsistent retention times, resolution changes, and increased peak tailing. By contrast, using a silica-based column in a basic environment can cause silica dissolution, particularly when working at a pH above eight. Technology made specifically for acidic or basic environments can help extend column life. For example, InfinityLab Poroshell HPH-C18 particles are made with an exclusive process to chemically modify the porous layer on a superficially porous particle to provide high pH stability. Selecting the right column for your application conditions is vital. 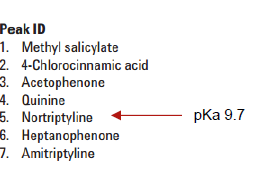 Figure 3 shows peak shapes with a column that has not been optimized for high pH environments. By injection 500, peaks 5 and 6 have already lost resolution. In this case, the column was not designed for the high pH of an ammonium bicarbonate gradient at pH 10. 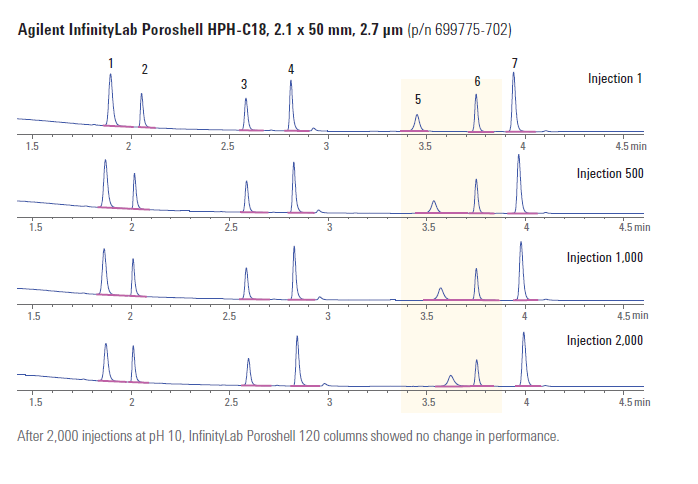 By contrast, Figure 4 shows that in the exact same conditions, the InfinityLab Poroshell HPH-C18 retains peak integrity, even after 2,000 injections. Figure 3: Chromatogram from a standard column on an ammonium bicarbonate gradient at pH 10. Figure 4: Chromatogram from InfinityLab Poroshell HPH-C18 column on an ammonium bicarbonate gradient at pH 10. Contaminants from dirty samples can build up on a column over time. The result is often peak tailing and increased pressure. Proper sample preparation before chromatography is essential to prevent residue build-up in the system and at the head of the column. Even seemingly clean samples may still have particulates that can be removed with a simple filtration step. Guard columns add an extra layer of defense to protect the analytical column. They are usually available in the same phase and pore size as the analytical column but are much shorter. Over time, if build-up is causing peak tailing replace the guard column. If the issue continues, it may be time to replace the column. Pressure is a result of the resistance to flow of the mobile phase through the system – and the column can be a major source of resistance. A gradual increase in pressure over time is normal, but excessive pressure is an indicator that something is wrong; As is a drop in pressure, which is sometimes a result of air in the pump. Effective ways to prevent pressure problems include filtering buffer solutions, properly preparing samples to reduce contamination, and performing regular column flushes. We recommend installing an in-line filter between the autosampler and column to remove pump seal debris, injector rotor debris, and sample particulates. Keeping a close eye on system pressure can give you an early indicator of system failure and can save valuable time and expense. Unexpected changes in pressure can mean your samples need further filtration, or that you have a partially plugged or plugged column frit. Other causes may include failing pump seals, a leak in the system, or the in-line filter needs changing. If the debris is not removed before separation, it may cause system issues or column problems leading to a loss of resolution. These issues can be difficult and time consuming to troubleshoot. For even the most experienced chromatographers, there are many aspects to consider when maximizing the efficiency and reducing downtime of an LC system. From loose fittings, to under-optimized or plugged columns, seemingly small components can have a big impact on your results. Still not solved your chromatography problems? Chromnews has a wealth of resources to help you maximize the productivity and efficiency of LC systems: www.chromnews.com.